Love your pic, you are so dashing in your shirt/tie! Thank you mommy for posting it. You definetly could go to the Grammy Awards........How old are you? My Coton, Chewie, my husband and myself watch Downton Abbey. We are hooked on the show as well. Look forward to each episode. Tuffy and I will join you cutie, we're hooked on that show. He is very handsome. 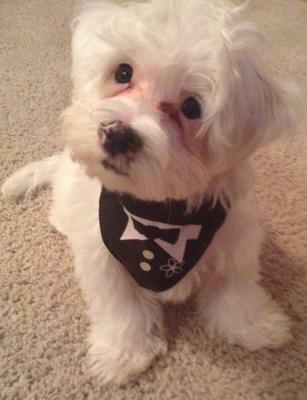 I love his kerchief. He doesn't look very old is he still a puppy? Thank u for sharing the picture. Master Parker you are just toooo cute! I think it looks like he's ready for the Oscars.